If you need snacks on the go, there are plenty to choose from but anything with nuts in, are a great option. I like to have snacks in my handbag so if I'm feeling tired or just a complete lack of energy, I can perk myself up quickly with something healthy. Nuts, dried fruits, and seeds are amazing as an energy boost. This is why, Whitworth have designed these little Shots, that you can take with you everywhere. They are all less than 100 calories, so a great way for calorie counters to keep track, however the sugar content is very high in all of these packs, but these are natural sugars so they are good sugars, hence why they are great for an energy boost. You can buy Whitworth Shots in most supermarkets and health shops so you can pretty much grab them anywhere. However, if you shop online, Amazon have a great selection of Whitworth products. 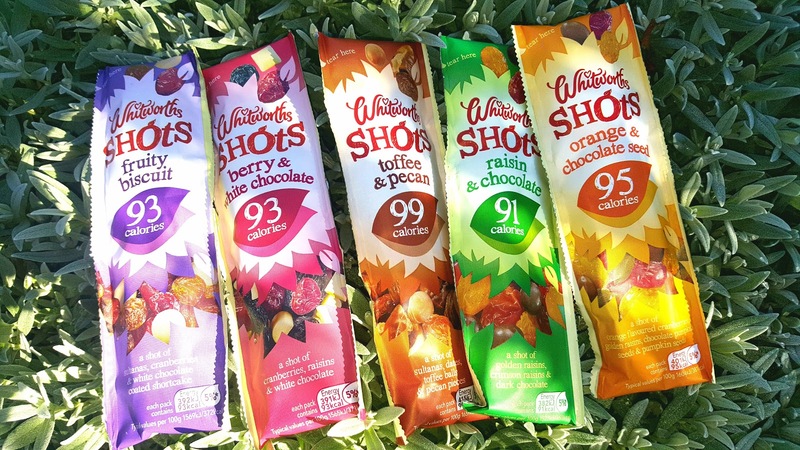 I use Whitworths for snacking and baking as they have a very extensive product line and include all kinds of dried fruits. Have you tried them ? What do you think ? My friend absolutely loves the Toffee & Pecan ones .... it sorts out her sweet tooth throughout the day. If you're not keen on dried fruits, they do also have Nut Shots !!! That's the great thing about Whitworths, they think of everybody ! !